If you’re like most of the world, you make time for following friends on social media. Positive posting and communication can be a real boost to your confidence and sense of connections to others. It can be surprisingly easy, though, to unconsciously slip into less healthful behavior on social media, and that can lead to anxiety and depression. LOLA loves Amy Poehler’s Smart Girls, an online community for young girls and the young at heart, which encourages women in volunteerism, activism, cultural exchange, and self-expression through the arts. Founded by best friends, comedian Amy Poehler and producer Meredith Walker, the organization is dedicated to helping girls cultivate their authentic selves. Their motto is: You Change the World by Being Yourself. Do you have a trick you do to remember names? Please let us know! Look Up is a lesson taught us through a love story, in a world where we continue to find ways to make it easier for us to connect with one another, but always results in us spending more time alone. Be inspired by this video! Social networking websites like MySpace, Facebook, Twitter, and Windows Live Spaces are services people can use to connect with others to share information like photos, videos, and personal messages. As the popularity of these social sites grows, so do the risks of using them. Hackers, spammers, virus writers, identity thieves, and other criminals follow the traffic. Don’t trust that a message is really from who it says it’s from. Hackers can break into accounts and send messages that look like they’re from your friends, but aren’t. If you suspect that a message is fraudulent, use an alternate method to contact your friend to find out. This includes invitations to join new social networks. For more information, see Scammers exploit Facebook friendships. To avoid giving away email addresses of your friends, do not allow social networking services to scan your email address book. When you join a new social network, you might receive an offer to enter your email address and password to find out if your contacts are on the network. The site might use this information to send email messages to everyone in your contact list or even everyone you’ve ever sent an email message to with that email address. Social networking sites should explain that they’re going to do this, but some do not. Think twice before you use social networking sites at work. For more information, see Be careful with social networking sites, especially at work. Talk to your kids about social networking. If you’re a parent of children who use social networking sites, see How to help your kids use social websites more safely. Are you wondering what social media marketing tactics the pros like to use? We asked top social media pros to share their hottest social media marketing tactics. In this article, you’ll discover strategies the pros use to boost their social media marketing. On LinkedIn, you shouldn’t send an email blast to every one of your connections. However, you can create lists of “tagged” groupings so you can send relevant and helpful information to your contacts at strategic times. 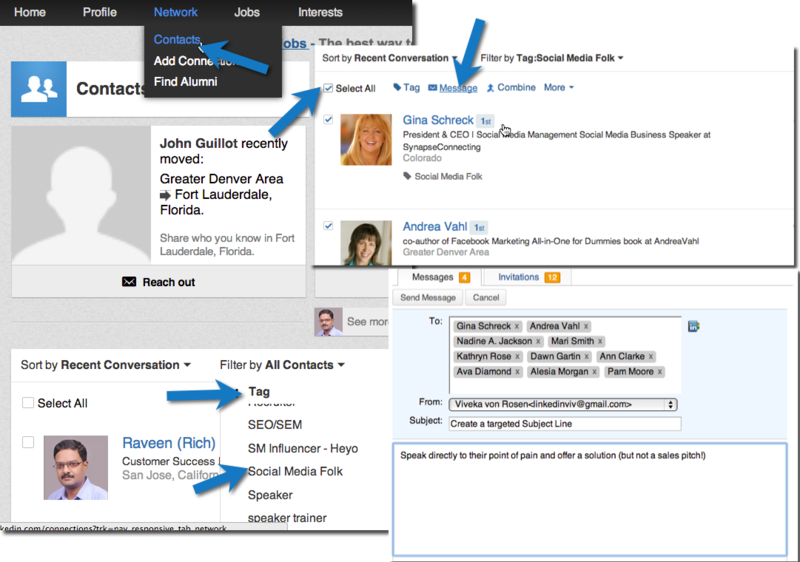 When you tag your connections on LinkedIn, you can sort/filter them by Tags and—wait for it—send a message to up to 25 people at a time. You can filter by tag and then send a message to up to 25 people. Employees have been fired when their employer construed their blog posts as sharing confidential information, making inappropriate comments about the company, or both. Posting company news, pictures, and even making positive comments about a company have cost bloggers their jobs. How about job seekers? Can having a blog, a personal web site, or an account on a social networking site impact your job search, for better or for worse? It could. One blogger posted recently that he lies in interviews. That wouldn’t thrill a prospective employer if they knew about it. Another job seeker’s blog mentions that she loves to party all night, drinks to excess on a regular basis, and steals on occasion. Again, not a profile that would thrill most employers. Should prospective employers be reading your personal information? Maybe not, but, if you put it on the Internet and it’s readily accessible, they can and they might. Some people list their personal web site or blog on their resume and most of us Google people we’re interested in knowing more about. There’s nothing to stop a hiring manager from doing the same. If it’s on your resume, the employer will look at it. One hiring manager I spoke to always looks at the applicant’s web site if it’s listed. Another told me that she would try to find out as much about the candidate as she could, including looking up the person online. Even if it’s not on your resume, if your blog, web site or profile contains information on your real identity, the people you least expect, and those that you certainly don’t want reading it, may find it. Not only your boss and prospective employers, but, also your customers, colleagues and coworkers. Don’t include a link on your resume to any site which includes inappropriate contentthat is not appropriate for a business audience. Be very careful what you put online. If you have a MySpace or Facebook account, people you won’t want to be reading your profile may be able to access it, even if you think nobody will read it. Make your account private, so only your friends can access it. Be extra careful, and don’t post anything that you don’t want a prospective employer (or your mom!) to read. Do consider creating a personal web site, if you’re unemployed, specifically related to your job search including your resume, samples, your portfolio, and certifications. Include only professional and academic information. Or use your profile on sites like LinkedIn to promote your experience. Don’t list your blog on your resume unless it’s relevant to the career field / position that you are interviewing for. For example, if you are seeking employment as a financial planner and you have a personal finance blog, include it. If you have a blog about your dog, don’t. Consider starting a blog related to your career interests. If you, for example, are interested in a career in real estate, consider blogging about industry trends, news and related topics. Write a job search blog. There’s a trend toward job seekers blogging to track their job search and market their skills. A job search blog can help with your job search and give you exposure, but, again, consider who else might read it before you start blogging. Post in haste, repent in leisure. Remember that a hastily written blog post critical of your job or detailing your wild night with a hot date can be read today, regardless of when it was posted. You may not even remember posting it, but, a potential employer will certainly keep it mind. Do be careful what you write. Keep in mind that just about anything that is online can be read by someone – or everyone. If you don’t want the world to read what you’ve posted, make sure they can’t. Don’t put it online or post it anonymously. The Electronic Frontier Foundation has information on how to blog safely and how to blog without getting fired. These suggestions include blogging anonymously, making your blog not searchable, limiting who can read your blog, and, when employed, focusing your blog on protected topics that you can’t be fired for writing about. There are many blogs dedicated to job searching and career building. Monster has a job search blog, as do a variety of other mainstream and niche sites. Read these job search blogs on a regular basis, review the advice that is offered, and pick up tips that will aid your job search. Blogging can become a passion, but, don’t let that passion hinder your employment prospects. Keep blogging, but, blog safely, securely and carefully, so your current or future career opportunities aren’t jeopardized.